Last year, Alzheimer’s Research UK asked me to tell a thought-provoking story imagining a world where Santa was affected by dementia. In the year since Santa Forgot first launched, over 200,000 more people in the UK have developed the condition and they’re surrounded by families that may be struggling to cope this Christmas. Many of us have been close to someone with a parent or someone they love very much in the grip of dementia. I remember visiting the mother of a friend in the very severe stages of dementia and seeing her not recognise her own son. Humans are ultimately social animals and the idea of being isolated from our social networks is as frightening as anything can be. Dementia is one of the most pernicious and unacceptable things that can happen and it can happen to anyone – even those most special to us. History has shown that dementia is no respecter of persons. Iris Murdoch had one of the greatest minds that the twentieth century ever produced, as a philosopher and a novelist, but she succumbed very quickly and very terribly to dementia. Santa Forgot imagines a world where not even Santa is immune to its devastating effect. But I have real optimism that with the support of the public, things can change rapidly. What matters to me so much is that Alzheimer’s Research UK is determined to find ways to defeat it so that future generations will only be reading about Alzheimer’s and not experiencing it. Part of the extraordinary revolution in human congress that has happened since the internet and social media have devoured our lives so much, is that we’ve become far more aware of the social network that connects us and of the stories of how dementia affects people. For me, Santa Forgot is a wonderful way of telling that story and showing the effects of dementia so clearly to people. Your response to Santa Forgot last Christmas has helped the charity invest more than ever to drive new breakthroughs in research this year and the pace of progress is improving. Our ability to understand and edit the human genome, our ability to get deeper and better imaging of the brain as it functions – all these things help scientists to understand what is going on in a mind that is deteriorating due to diseases like Alzheimer’s, the most common cause of dementia. There is still a lot of work to do, but it is an exciting period for neuroscience. There is so much development in technologies and genomics, that it is possible that our physical bodies could be augmented and enhanced in such a way that we can live for even longer. But that’s pointless if our brains are still capable of deteriorating through disease. The human brain is the most complex organism known in the universe and the human mind really is the final frontier. If I were a young student now I would put everything I had into trying to understand it – like a seafarer in the 18th century discovering the world and new continents. Today, the most exciting thing people can do is research into the brain. Although science is making strides, research funding for dementia still lags behind other disease areas. We will see the same breakthroughs in dementia that we’ve seen in heart disease and cancer, we just need to support our scientists. If you can help Alzheimer’s Research UK power life-changing dementia research, please do something simple. Share Santa Forgot and donate to Alzheimer’s Research UK this Christmas. 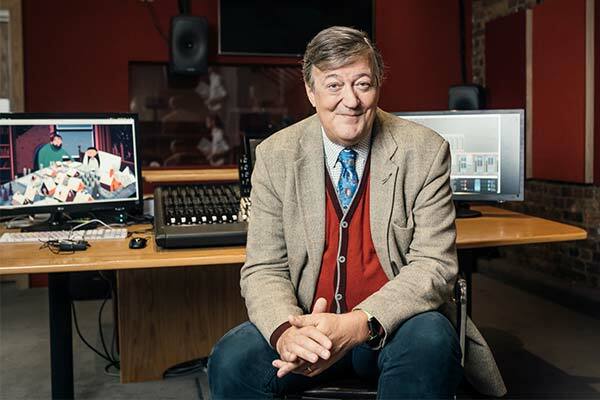 Stephen Fry is an English actor, screenwriter, author, playwright, journalist, poet, comedian, television presenter and film director. Whilst at university, Fry became involved with the Cambridge Footlights, where he met his long-time collaborator and friend Hugh Laurie. As half of the comic double act Fry and Laurie, he co-wrote and co-starred in A Bit of Fry & Laurie, and took the role of Jeeves (with Laurie playing Wooster) in Jeeves and Wooster. Fry's acting roles include the lead in the film Wilde, Melchett in the BBC television series Blackadder, the titular character in the television series Kingdom, a recurring guest role as Dr Gordon Wyatt on the crime series Bones, and as Gordon Deitrich in the dystopian thriller V for Vendetta, Mycroft Holmes in Warner’s Sherlock Holmes: A Game of Shadows and The Master of Laketown in Peter Jackson’s Hobbit trilogy. 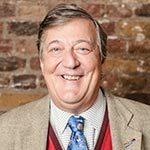 He has also written and presented several documentary series, including the Emmy Award-winning Stephen Fry: The Secret Life of the Manic Depressive, and is also the long-time host of the BBC television quiz show QI. He played Prime Minister Alistair Davies in the 9th season of Fox TV’s 24: Live Another Day. As well as his work in television, Fry has contributed columns and articles for newspapers and magazines, appears frequently on radio, reads for voiceovers and has written four novels and three volumes of autobiography, Moab Is My Washpot, The Fry Chronicles and his latest, More Fool Me. A new sitcom for CBS, The Great Indoors, aired in both the US and UK in the spring of 2017.